Fluid Level Pump Controller Relay Module for controlling liquid level in tanks, wells, reservoirs etc. Minimum and Maximum float switch sensors supplied enable automatic control of fluid level in a vessel using the onboard relay to operate a pump (not included) of up to 240Vac or 28Vdc, 5 Amps. DRAIN mode allows you to automatically pump fluid out when the level rises above the Maximum level. The module turns the pump off once the fluid falls to the Minimum level. FILL mode allows you to automatically pump fluid in when the level falls below the Minimum level. The module turns the pump off once the fluid rises to the Maximum level. Suitable for automated fluid distributors, drink dispensers, washing machines, irrigation systems, water and fuel tanks, burners, central heating, etc. Minimum and maximum horizontal float switch sensors included. 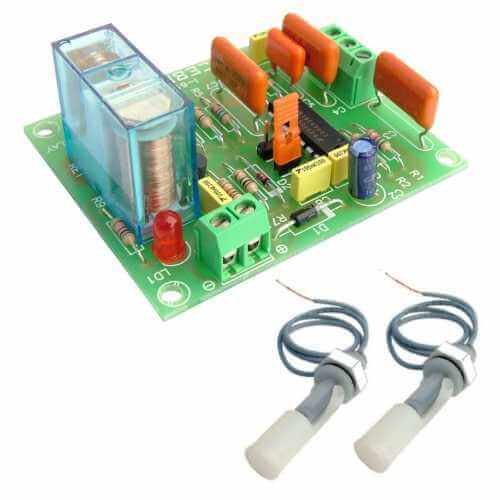 Module features reverse polarity protection, LED relay active indicator and screw terminal blocks for connections. Output relay rated to switch 5 Amps @ 240Vac/28Vdc Max. Pump not included.